Samsung is going to launch Galaxy S9 on February 25. However, reports surrounding the Galaxy Note8’s successor Galaxy Note 9 are already making headlines. The recent patent from Samsung throws light on the upcoming Galaxy Note 9 features, designs, and release date. The upcoming Galaxy Note 9 is said to be codenamed ‘Crown.’ The Samsung Galaxy Note 9 is expected to land with a truly all-glass front that will have an under-glass fingerprint scanner, sensors, and selfie camera, as per reports. The phablet will also have a Super AMOLED screen that will act as a light source for the sensor. At this moment, when everyone else is hunting for the Samsung Galaxy S9 leaks and details, it is very early to talk about Galaxy Note 9 specifications. However, there are some things which everyone is speculating for Note 9 like, 7nm Qualcomm Snapdragon 845 and the latest Exynos chip in certain territories. Note 8’s successor is also said to increase the RAM capacity to 6GB. The phablet is expected to feature a USB Type-C port, a dual camera, waterproofing, and a dual camera setup as well. 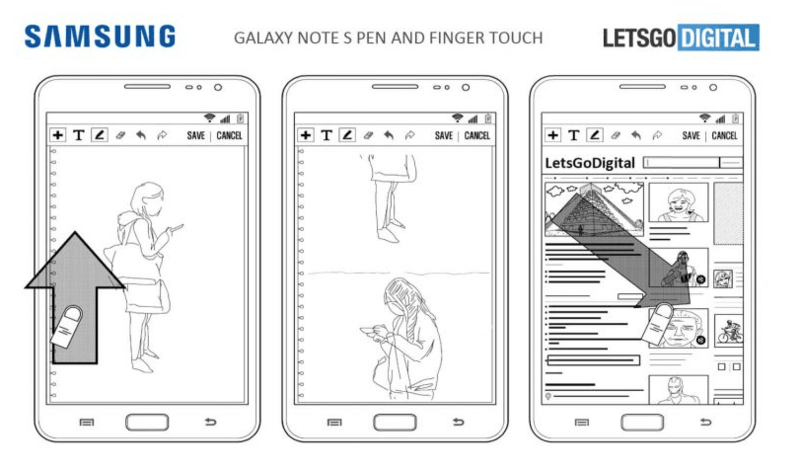 The above image is from a recent patent provided to Samsung, filed at World Intellectual Property Organization (WIPO). As per the image, Galaxy Note 9 will feature a 6.4in 4K display and a stretched out display might result in a design given in the patent. However, in case, if South Korean tech giant is not able to apply this new type of screen then we might see very similar specifications as for the Note 8, with a 6.3in Quad-HD+ (2960×1440, 18.5:9, 521ppi) Super AMOLED panel. An Android Police reader has recently discovered a feature dubbed as Intelligent Scan – an answer to Face ID by the looks of it. This feature is expected come firstly in the Galaxy S9 and then will come to Galaxy Note 9. Samsung has unveiled the Galaxy Note 8 on 23 August 2017 and it went on sale on 15 September. By looking at the South Korea tech giant’s timeline to launch Note series smartphone, Samsung Galaxy Note 9 is rumored to get a release in August and the sale is said to begin in the mid-September.